After many requests we designed this workshop for our pastry fans. Over the course of 4 hours you will learn to mix and bake our flaky and delectable scones, roll out crackers that will impress your guests, and mix a pie (or galette crust) that melts in your mouth. To top it off, you will get to taste all of it and take home any leftovers as well as recipes. Morning coffee & tea provided. Enjoy an incredible hands on day of learning at Brickmaiden with owner & founder Celine Underwood. Our workshops offer ample opportunity to explore the basics of sourdough bread baking. We will explore the language of baking & the properties of wheat. You will learn about gluten and sourdough culture and how to mix, form, and bake your own sourdough bread. 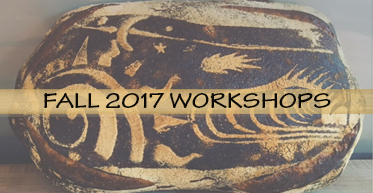 Attendees will take home their freshly baked loaves, a recipe for future use and their own sourdough starter.